1. PAR Formulations - Walk-In Interviews for Multiple Positions on 14th Apr' 2019 @ Hyderabad..
2. SMS Lifesciences India Ltd - Walk-In Drive for Freshers & Experienced - Production & QC on 19th & 20th Apr' 2019..
3. Aurobindo Pharma Limited - Walk-In Drive for Multiple Openings in Production, Packing & QC on 14th Apr' 2019..
5. Walk-In Interviews for QA, RA, PPIC, Production, Warehouse, Maintenance on 14th Apr' 2019 @ Nanz Med Science Pharma Pvt. Ltd..
6. Walk-Ins for Fresher & Experienced M.Sc Chemistry - QC Chemist on 13th Apr' 2019 @ Global Calcium Pvt. Ltd..
7. Jubilant Generics - Walk-Ins for QA, QC, Production on 13th Apr' 2019 @ Hyderabad..
8. Unison Pharmaceuticals - Walk-In for Officers to Sr. Executive Level on 14th Apr' 2019 @ Ahmedabad..
9. Farbe Firma - Walk-Ins for QA, QC IPQA, Production on Mon - Sat @ Ankleshwar..
10. Mega Campus Drive for B.Pharm / M.Pharm Freshers for Pharmacovigilance on 15th Apr' 2019 @ DPU, Pune..
11. Zydus Cadila - Walk-In Interviews for QC / QC-Micro / Manufacturing / Packing on 14th Apr' 2019 @ Indore..
12. 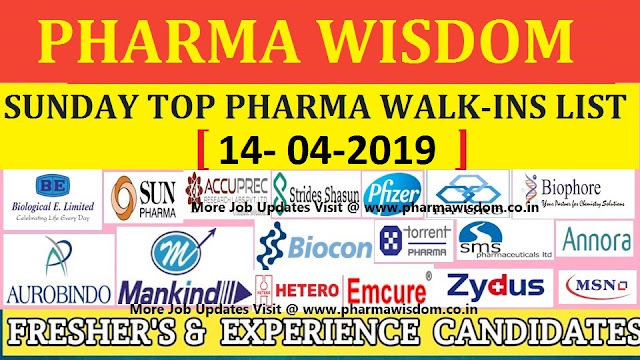 AUROBINDO PHARMA LTD - Walk-In Interviews on 11th to 15th Apr' 2019 @ Hyderabad..
13. 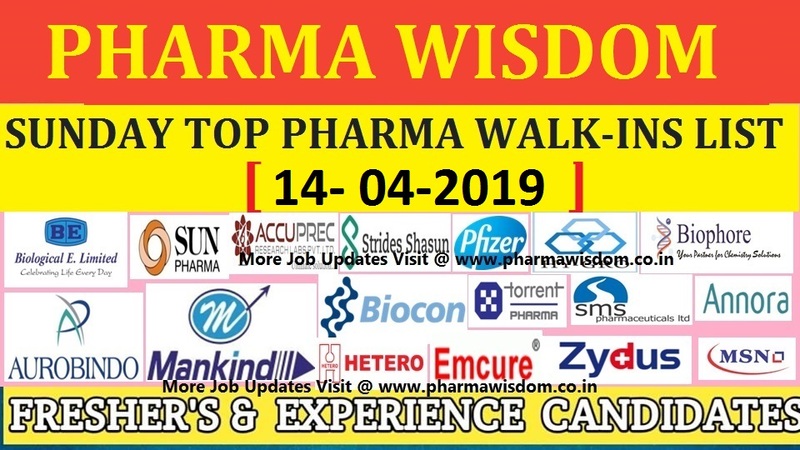 Sri Krishna Pharmaceuticals - Walk-Ins for QA / IPQA / AQA / QC on 15th to 20th Apr' 2019 @ Hyderabad..
14. Openings for Freshers @ Aurobindo Pharma Ltd for Internship - FE&D..
17. Vital Pharma - Walk-Ins for QC-Asst. Manager / Purchase Executives / Personal Assistant on Apr' 2019 @ Hyderabad - Apply Now..
18. Ajanta Pharma Limited - Walk-In Interviews for Multiple Positions - QC, Production, Packing on 21st Apr' 2019..
19. Syngene - Recruitment Drive for Discovery Chemistry on 13th Apr' 2019 @ Bangalore & Kolkata..
20. Brundavan Laboratories Ltd - Walk-In Interviews for Manager / Sr. Manager - R&D on 12th & 13th Apr' 2019..
21. Unison Pharmaceuticals - Walk-In Drive for Officer / Sr. Officer / Executive / Sr. Executive - ADL on 14th Apr' 2019 @ Ahmedabad..
22. Atul Ltd - Walk-Ins for Multiple Openings - Production, QA, QC, R&D, IT, Engineering, Maintenance on 14th Apr' 2019..
23. INDOCO REMEDIES - Walk-Ins for Production / Packing / QA / QC on 14th Apr' 2019..